Today was my last day in Ko Tao and I really really didn't want to leave, despite my excitement for the full moon party. Ko Tao has been my favourite place of all and I feel like could spend a whole week here. After that I fancied a manicure and pedicure so we went a found a parlour that offered Shellac. For 1,325 baht (about £24) they removed my old Shellac from my toes and redid my toes and fingernails! Such a bargain, as it'll last for 3 weeks and back home that would cost about £80-£90! 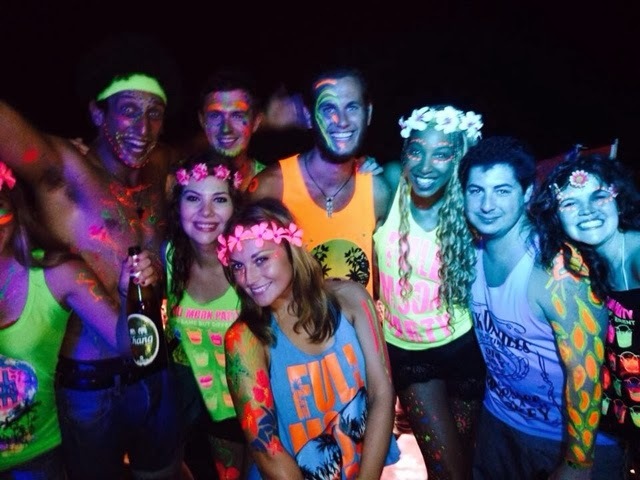 Last stop was to get my full moon party outfit, which had to be an alluminous colour to ensure I glowed brightly at the party. 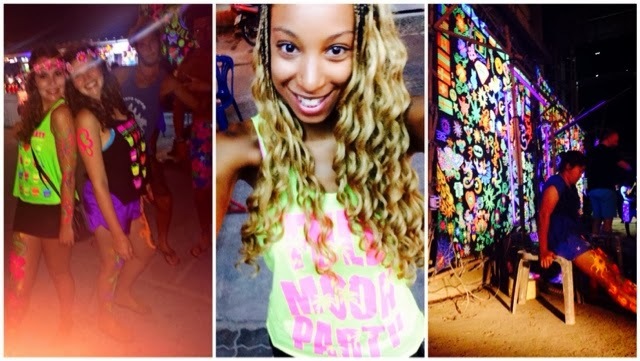 I went for a highlighter yellow top with pink writing that said full moon party! Before I knew it, it was almost 2pm and time to meet our transfer to pier and say goodbye to the lovely Kirsty who I'd now grown close to having spent more than 2 weeks straight sharing hotel rooms, cabins and sleeper bunk beds with! As a group we'd decided we wanted to tip Sek because he'd been such an awesome G Adventures tour guide. I gave 500 baht and I think most of us did the same or more. Sek had been unwell for the second part of our tour yet he'd still arranged activities, group dinners and even my ferry to Koh Phangan which wasn't part of the tour, so in my eyes he'd been a little star! We said our goodbyes at the pier and funnily bumped into Emily and Helena who were just arriving in Ko Tao. Then it was just the 4 of us: Carlos, Sarah and Reiss and me off to Ko Phangan. The ferry was pretty awful, as the waves were really against us and I hadn't eaten since breakfast. It was basically like being on a rollercoaster ride, but without the option of being able to get off! It was also delayed over an hour because of the conditions. There were lots of people chucking up which wasn't pleasant to hear or see either. When we finally arrived none of us had booked transfers so then it was time to find the public buses to Haad Rin, the song-taew was only 100 baht so Reiss and I went for that option. Our hostels were in different areas though so we had to take separate buses, it was then I was of completely alone! The bus was just heading to Haad Rin and I didn't know if my hostel would be easy to find so all the way I was a little on edge. However, I kept looking out the window to ensure we were heading to Haad Rin after 5 minutes I begun to see signs and relax a little. Luckily after about 20 minutes I spotted my hostel (Our House on Tommy Road) and called to the driver to stop. He stopped a minute later and everyone got off the bus, so I guessed the buses usually stop in the centre and you have to find your way from there. Bloody lucky, I'd been looking out for the hostel otherwise I would have been plonked somewhere in Haad Rin with no idea!! As soon as I arrived I realised I'd chosen a great hostel! It wasn't fancy or anything but the bar was full of young people and it was really central. Right outside the hotel there was also a line of Thai women doing glow in the dark body painting which I knew I was going to take full advantage of later on. I checked in, and straight away two Canadian girls started talking to me and inviting me to come out for food and the party tonight. Result, how easy was that! They had already started drinking though and I was stone cold sober so it was a bit overwhelming. I now think it would have been better to arrive the day before to get to know everyone had I not been on my island hopping tour with G Adventures. My dorm was a full 12 bed and it wasn't long before I made friends with 4 other blokes and 2 girls who seemed to be a bit of a unit. I liked these guys straight away because they were chilled out but super friendly. After a tasty slice of pizza and a chicken kebab, Kelsey and I got painted up on the street outside our hostel. Kelsey went for a flower patterns and I went for stars on my right leg and a butterfly on my left arm, the price was 300 baht for a large design and 200 for a small design. When I went back to our hostel I discovered there were all colours of glow-paint to help yourself to, so then we decorated our faces and I moved onto my left leg. I was still hungry (having skipped lunch) so I joined the rest of the group from my dorm to eat just across the road from the hostel. There I discovered Jacob and Hayley were a couple and were travelling together since graduating from uni, Rich and Marcus were from South-End and were on a round the world trip which they were 6 months into and Julia (a Maria Carey look-a-like!) was from Germany but had excellent English skills. After the food we started on drinks. Basically no one even thinks about buying drinks by the glass on full moon! 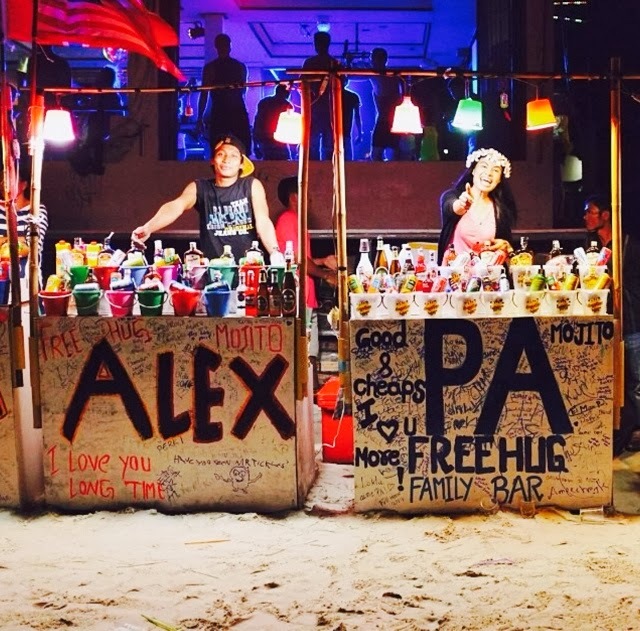 It's all about the buckets which start around 250 baht up to 500 in busy areas like the beach. They are properly strong and the spirits and mixers come in proper sealed bottles so you know it's not dodgey. 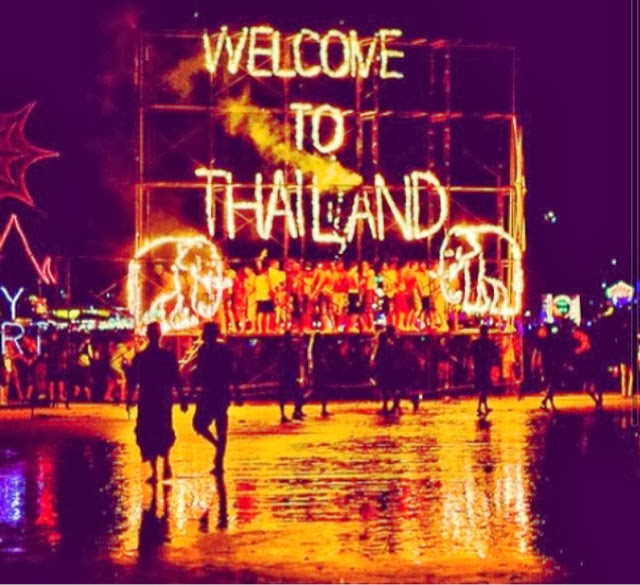 Everyone had warned me that everyone looses something at the full moon party and not to take any valuables to the party so unfortunately I have limited photos of the night. 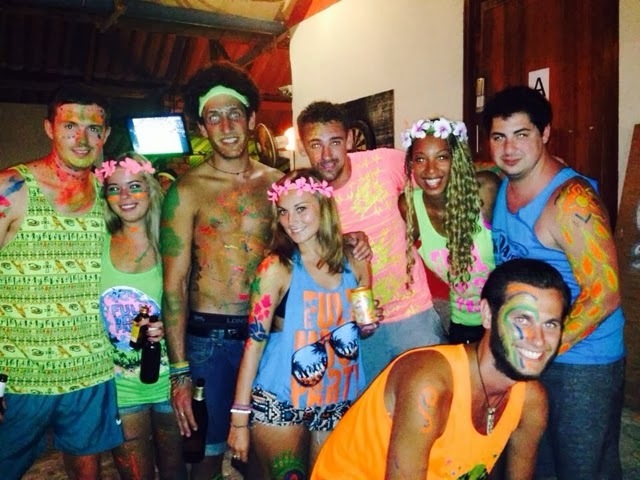 I found a couple of our hostel pre-party on the Facebook page and via Instagram, but if you want to see what the full moon is like I recommend you book a flight and come for yourself. Words really can't explain how sick the beach party is. 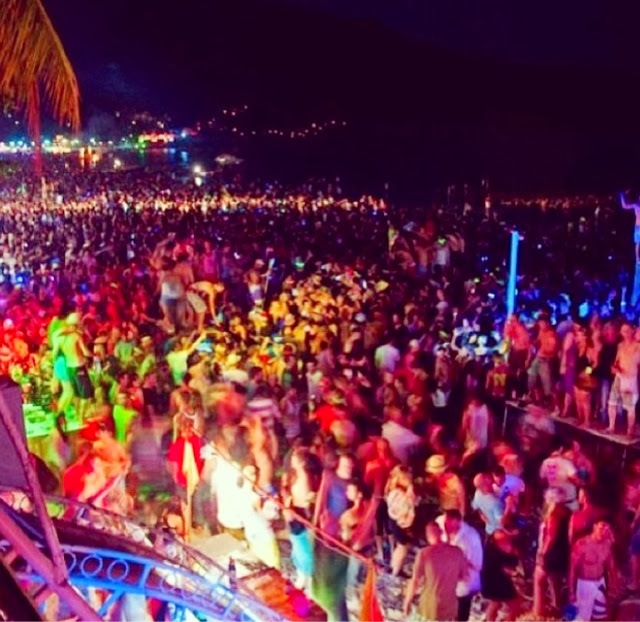 30,000 people, pumping choones, cheap booze and U.V lights all over the beach makes one heavy PARTAY!!! Too many people for me. You are certainly having one hell of a holiday kiddo!!! !